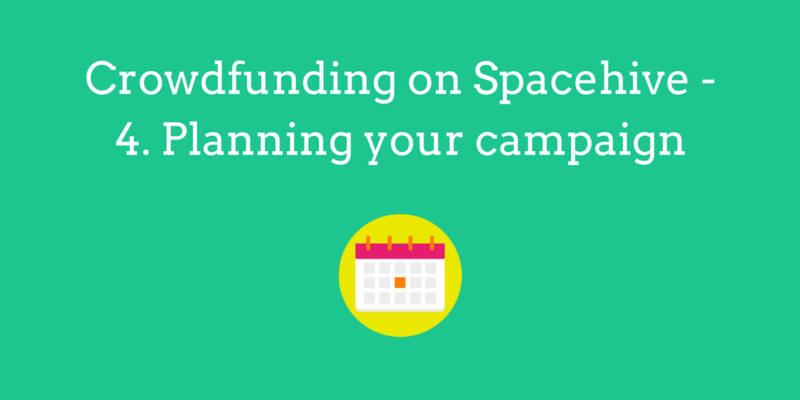 The success of a Spacehive campaign is all in the planning. And there’s a lot to plan, such as choosing how long to run your campaign for, who to have on your campaign team, working out who your potential backers will be, approaching businesses, investigating marketing methods and holding events. 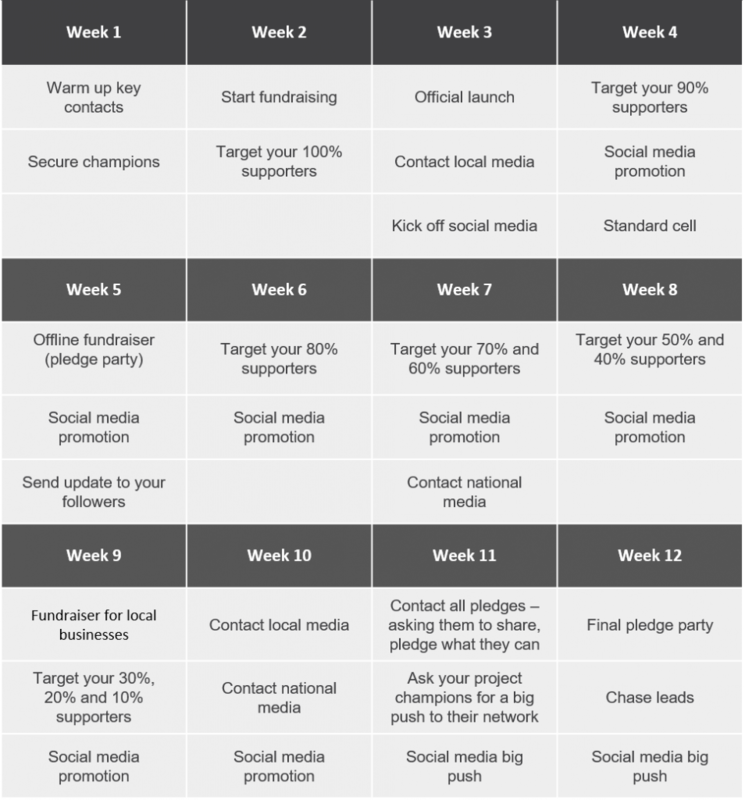 Use this extract from The Ultimate Guide to Crowdfunding to create your campaign weekly planner and organise yourself for success. The ideal length for a Spacehive campaign is dependent on the type of project, prior community engagement, and funds already acquired. As a general rule of thumb use the table below to select a campaign timeline up to 12 weeks. You can set your campaign dates for up to a year, but we strongly recommend against it. It’s easier (and more enjoyable!) to run a short, sharp crowdfunding campaign that has been thoroughly planned than to run a longer campaign that you plan as you go. Shorter, planned campaigns maintain momentum and uses the time pressure to spur action. The longer your campaign, the harder it is to maintain the energy and commitment. Running a crowdfunding campaign involves many different skills – from putting together the business plan and writing the copy for your project pitch to selling your idea to potential backers and marketing it online and offline. It’s a lot of work for one person, though now impossible. Marketing and social media skills – to promote your campaign via email, posters, leaflets, events, social media etc. Volunteers: Looking for people to join your team? We’ve partnered with Do-it and Team London so you can ask for volunteers directly from your project dashboard! Take the time to create a comprehensive list of every person and group you could approach during your campaign. The people on this list could be anyone: friends, family, local and national newspapers, local businesses, corporates, large grant bodies, council community funds, social groups, schools, online groups, local bloggers and celebrities! They might be interested in pledging, or perhaps in donating their time, skills, or promotional abilities. The next step is to list these target individuals and groups in order of their likelihood to get involved. The likelihood, estimated as a percentage, is what determines the order you should approach them in your campaign. Start with the people who are most likely to pledge (100%, 90%) and then move on to the next levels until you’ve exhausted every potential backer on your list. Before you officially launch to the general public, get your 100% folk to pledge within the first few hours that you set your campaign dates and start crowdfunding. Call, text, knock on their doors if needed! Then a few hours later, once you’ve collected your first 10-20 pledges from your closest friends and family, you can officially launch to the wider world. The soft launch ensures that your project gets off on the right foot; built on a burst of excitement and sudden pledging energy. Without a soft launch people will land on your page, see few pledges and feel a lack of confidence as well as lack of urgency to pledge. Timing is essential: If you approach a group too soon, you might not get the result you want. Wait until you have a significant number of pledges before approaching the bigger backers. That said do get in touch with potential backers early on, letting them know you’re running a local project and would appreciate their feedback. Just don’t ask for a pledge until the time is right! Although there’s a lot that needs doing in running your campaign, the most important bit is to remember you don’t need to do it all at once (and if you have a good team, you don’t need to do it all by yourself). Every project is different so create a plan that suits your timeframe and resource but below is an example of how a good campaign schedule could look. Ready to get started? Click here to start creating your project. This is an extract from Spacehive’s complete guide to crowdfunding, download your free copy of the guide here.